WASHINGTON, DC, July 4, 2012 (ENS) – Plans for Independence Day fireworks on the National Mall in Washington are going forward, but across the country many areas have canceled planned fireworks shows due to storms or wildfire risk. Fireworks have been canceled in East coast and Midwestern states after a storm on Friday claimed 24 lives and knocked out power to about three million homes and businesses from Ohio to Illinois to West Virginia to Maryland. Power is still out for about 900,000 electricity consumers. Four planned fireworks shows have been canceled in Maryland because of the power outages, with officials saying police and fire personnel are needed for other duties. The warning persuaded community and fire officials in Kent cancel a fireworks show planned for Saturday. “We are trying to consider the safety of all of the residents,” said Kent Fire Lieutenant Craig Peeps. In Illinois, half a dozen Chicago suburbs have canceled their plans for fireworks displays due to increased fire risk from dry weather or weekend storm damage. Across the West, firefighters are spending Independence Day battling scores of wildfires and holiday fireworks have been canceled across the region. Colorado officials have called off holiday displays from Fort Collins to Colorado Springs to Boulder, while law enforcement officials are publicizing the fines people will face if they are caught violating personal fireworks bans. The Colorado Springs Fire Marshal has denied all permits for commercial fireworks for the 4th of July, citing firefighting resources committed to the Waldo Canyon Fire and the continuing extreme fire danger in the city. 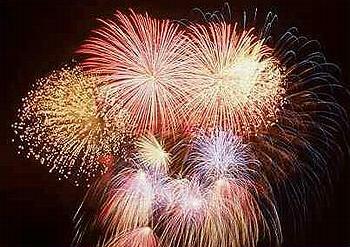 Nine commercial fireworks displays were planned in the city this week. Boulder canceled its fireworks show planned for Folsom Field at the University of Colorado due to extremely dry conditions in and around the city. “While it’s disappointing that conditions warrant canceling the fireworks display, public safety is the first priority,” Lew Kingdom of Wright Kingdom Real Estate, a primary sponsor of the event, told ABC TV in Denver. The Colorado resort towns of Telluride and Vail have both canceled their fireworks shows due to extreme fire danger. In Wyoming, also hard-hit by wildfires, Jackson Hole Fire/EMS Chief Willy Watsabaugh said planned fireworks shows at the base of Snow King Mountain on July 4 and Teton Village on July 3 and 4 have been canceled due to fire danger. “Data shows that this year is drier than it was in 1988 and 2000 when wildfires created dramatic impacts to our area. While we are aware that fireworks shows are a tradition and a summertime highlight for residents and visitors alike, the conditions are ripe for a dramatic fire event, and one only needs to look throughout the state or the western region to see the impacts wildfires can have on residents, visitors and the landscape,” Watsabaugh said.